The most wonderful time of the year is right around the corner. 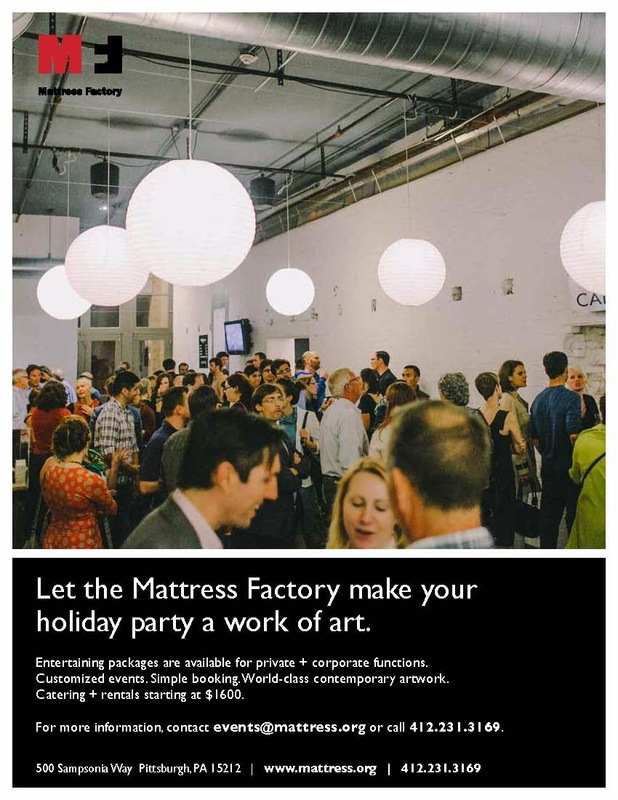 As a completely customizable venue that allows for completely creativity, the Mattress Factory is one of the most spectacular event spaces in Pittsburgh. All-new, very special entertaining packages are now available just in time for the holidays. The best part? You can add artistic, hands-on activities to any events package and make your celebration truly memorable. Gallery tours. Educator-led workshops. Installation labs. Have other ideas? We're here to listen. For more information, contact the MF Events Department at events@mattress.org or call 412.231.3169. The Factory 500 member group visited Etna on Saturday, October 18th for a tour with local artists, a behind-the-scenes visit with an atelier, and topped off with drinks at a local bar. The first stop was Etna Studios, with artists John Clines, Sally Hardon, Sandy Kessler Kaminski, Paula Klein, Lisa Koi, Rise Nagin and Kathy Stept. Each artist was on hand to give a tour of their space and discuss their work. 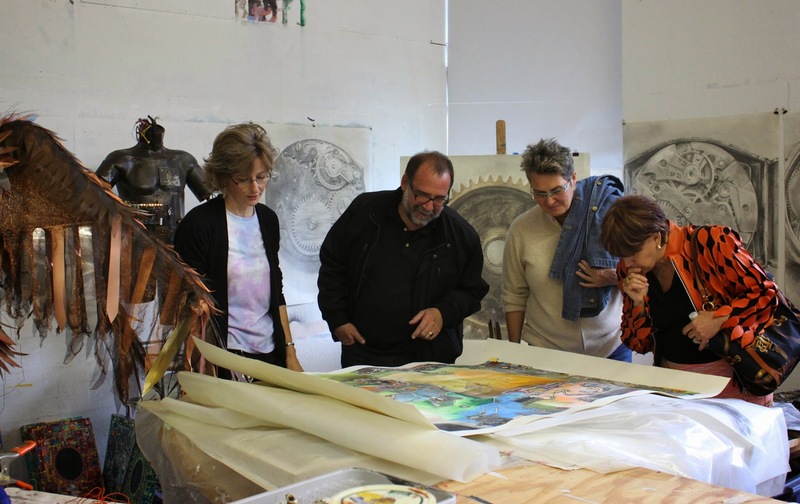 Artist Sandy Kessler Kaminski shows prints to the Factory 500 members. The second stop for the afternoon was River Projects, a company formed in 2014 by Brian Reneski and Mark Barill. Brian is also the US Representative for Beyer Projects. Beyer Projects produces sculptures and limited editions for many artists, including Anish Kapoor and John Baldessari. Mark and Brian gave the members an overview of the work they have created, from large installation pieces for Beyer Projects to Mark's detailed museum dioramas. Brian Reneski discusses some of the work in their studio. 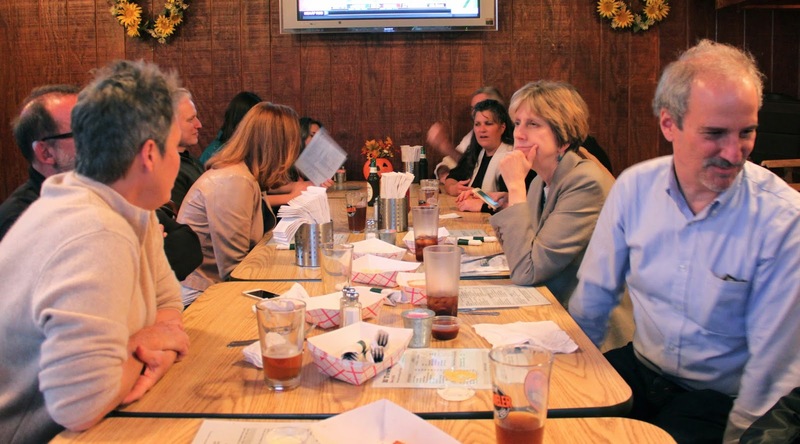 The last stop was E Town Bar and Grille, where the members enjoyed pumpkin beers and some of the best homemade mozzarella sticks and fish sandwiches in town. The members relaxed in E Town's back room. 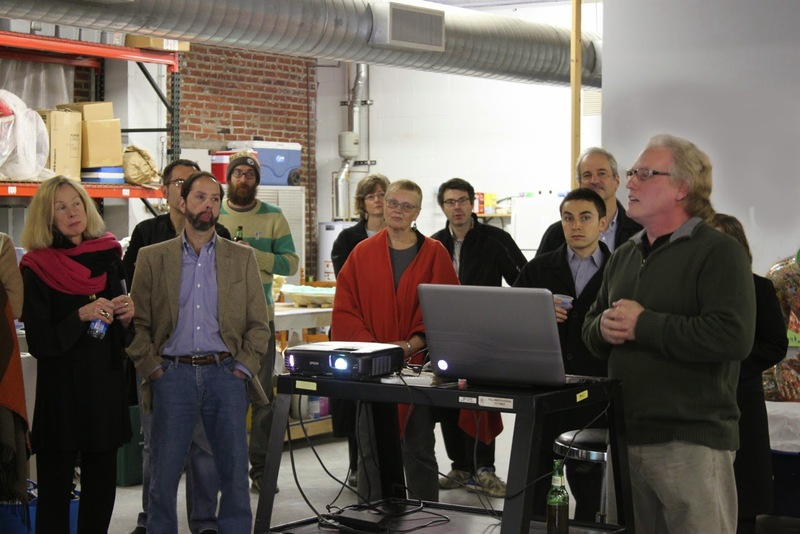 Thank you to everyone who came to Etna on October 18th! You can see more photos from this–and other Factory 500 events–on our Flickr page. Factory 500 is the museum's premier membership program, chaired by Susan Lammie. The group tours private collections, artist studios, local businesses and other arts destinations in Pittsburgh several times throughout the year. Don't miss out – join now! PREVIEW // ARTLab: Building a City With Ryder Henry! Danny Bracken considers the integration of technology and nature in our lives in his new work at the MF. He encourages playful exploration of his work along with the idea of how awe-inspiring both technology and nature are capable of being. One of the pieces in Bracken’s installation, Again and Again, encases an interactive screen and video inside a rocky mountain. The screen shows video feedback—similar to the audio feedback you hear when a microphone is put next to its own speaker. In his piece, Danny Bracken’s feedback is visual, the recording is of the screen that is showing what is being recorded, it’s a loop! The light and design that show up on the screen is fluid and whimsical and you can change it by moving your hands between the video recorder and the screen. Danny Bracken set up a different video feedback loop in the lobby just for ARTlab last Saturday. Visitors checked out Bracken’s exhibit in the basement gallery. They interacted with the feedback loop, investigated a unique indoor double rainbow and watched the green grass grow. Then visitors came back upstairs and played with more video loops while interacting with the artist himself. In his piece entitled Diaspora, artist Ryder Henry builds a miniature city constructed out of recycled materials. He meticulously uses a formulaic construction of his own design that does not comply with what typically constrains our understanding of cities and the world. It is this combination of Ryder’s explicit imagery and outlandish ingenuity that results in a captivating installation. At the ARTLab on October 18, you can experience Ryder’s artistic process first hand. Come and interact with him and create your own building using his method. In his piece, Ryder uses materials such as gum wrappers, cigarette boxes, and shopping bags. To him, the simplicity of these materials is a fundamental theme in his artwork. During ARTLab, guests will use his much sought-after and—in his words—“perfect” material: Trader Joe’s coffee cans. Collectively, participants will create a community that echoes Ryder’s work. Be sure to join this Saturday's ARTLab, and follow the museum's Facebook and Twitter pages for more information. For the most up-to-date information about ARTLabs and other educational programming, please check the MF Calendar.